At last, my book, Best Practices for Teaching with Emerging Technologies, has published! The paperback and hardcopy versions are now available directly from Routledge and Amazon. A Kindle version will be available on Amazon and an eBook option will also be available via Routledge shortly, although I have no exact date about either. This has been a huge project and I am very grateful for all the instructors who shared their practices, ideas, resources, advice and willingness to review the book. Thank you so much to you all! 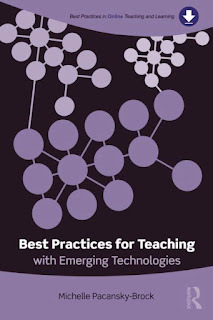 I wrote this book so it would be relevant to both 2- and 4-year instructors who are both experienced and completely new to the idea of weaving web-based technologies into their classes. It is packed with practical advice and ideas, always keeping students and learning as the central focus. Rather than an explosive list of new technologies to check out, you will find relevant tips and showcases from college classrooms, infused with my own personal journey about how social media and web 2.0 technologies revolutionized my vision of teaching and learning. The book is accompanied with an online resource site, as well, which is intended to augment your learning as you read and encourage you to expand your horizons and use of new tools in your own professional development. I will continue to share related events and discussions about the book on my blog, Twitter, and Google+! Cheers! Congratulations on the publication of your book! Very exciting! Thanks so much, Diana. Nice to hear from you!